Assistant Professor in the Department of Family Medicine and the Department of Community Health Sciences at the University of Calgary in Alberta and a member of the Interdisciplinary Chronic Disease Collaboration. Objective To present an overview of the methods of economic evaluation in health care, using examples of studies applicable to primary care. Sources of information The main concepts discussed in this article were derived from expert opinion and substantiated with well respected textbooks and comprehensive Canadian guidelines. Examples of cost-effectiveness estimates were taken from the published literature. Main message We describe the basic principles of economic evaluation and provide an introduction to its interpretation, using examples of studies applicable to primary care. Conclusion A basic understanding of health economics will allow primary care practitioners to begin to incorporate economic data, including that from economic evaluations when they are available, into resource planning for their practices. Primary care physicians have traditionally played an indirect but important role in the allocation of health care resources. Every decision to order a diagnostic test, prescribe a therapy, or request a consultation from a specialist, each with the goal of improving or maintaining patient health, inevitably reduces the pool of available health care funds. However, while physicians specialize in understanding the safety and effectiveness of tests and treatments, most have less experience assessing the costs and economic implications. This task has traditionally fallen to government policy makers and health care payors. Figure 1 depicts a hierarchical model of primary care physician payment with increasing levels of responsibility for resource allocation. As the model of primary care payment changes, practices are gaining additional responsibility for deciding how resources should be allocated across groups of patients. It is therefore becoming increasingly important for primary care physicians to develop a systematic approach to health care priority setting, including assessing the costs and benefits of interventions. If Medicare is to be sustainable, some consideration of costs seems inevitable. Depending on the specific financial reimbursement arrangement, primary care physicians might have more or less direct responsibility for resource allocation. For example, in Canada, physicians do not have a financial stake in the reimbursement of laboratory tests, the cost being borne by the health care system (although it should be acknowledged that the use of these resources will indirectly affect the amount of funds available for other health care programs or interventions). On the other hand, physician groups who have the responsibility of overseeing the allocation of health care funds, as in the examples noted above, are faced with deciding which health care programs to implement for their patient populations, often within fixed budgets. For example, a physician group might wish to provide after-hours care, chronic disease case management, and lifestyle modification programs, but the members find that they do not have enough funds to cover all 3. Alternatively, they might have a specific objective and type of program in mind, such as diabetes education, but are faced with several methods of implementation, each of which varies in resource intensity. In either case, they will have to carefully weigh the pros and cons of each, as well as the costs, in order to determine how best to allocate scarce resources. While political and personal considerations will always enter into the decision-making process around health care resource allocation, economic theory can provide a framework within which decision makers, including primary care physicians, can prioritize spending. In this paper we present an overview of the methods of economic evaluation in health care, using examples of studies applicable to primary care. To better illustrate the relevance of economic evaluation to primary care practice, we use Alberta’s PCNs as a case study. The main concepts discussed in this article were derived from expert opinion and substantiated with well respected textbooks and comprehensive Canadian guidelines. Examples of cost-effectiveness estimates were taken from the published literature. 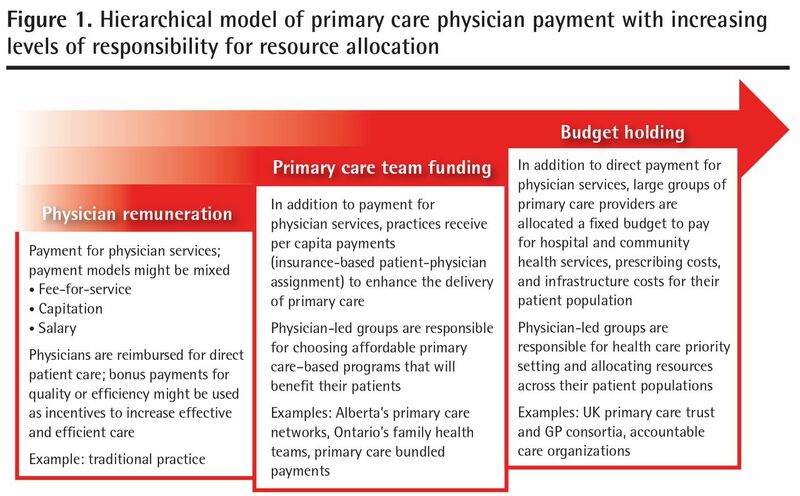 In Alberta, primary care reform has taken the form of PCNs, an example of a primary care model in which practices hold a budget to supplement care for their patients outside the usual fee-for-service model (Figure 1).6 Approximately 80% of eligible family physicians in Alberta currently participate in PCNs.6 Additional funding of $50 per enrolled patient per year (increased to $62 as of April 2012) is provided to PCNs to support activities that fall outside the typical physician-based fee-for-service model, but which are in accordance with specified objectives: improving access to primary care, increasing the emphasis on health promotion and disease management, and improving coordination of care.6 Consequently, a hypothetical group of 20 family doctors, each caring for an average of 1200 rostered patients, will be allocated $1.2 million in additional funds annually. Although these additional funds are substantial, they are not enough to support every foreseeable initiative, and budget overruns are not covered by provincial health ministries. Therefore, PCNs are faced with deciding how to efficiently allocate these additional resources to best meet the needs of their patients, considering the priorities laid out by the province. Among other factors, consideration must be given to the populations and disease areas to be targeted. Once a local set of priorities has been identified, the next step is to decide which specific initiatives will produce the best results within the budget. Broadly speaking, then, one of the important objectives for a PCN is to maximize the health gains for its patient population using a fixed sum of money. This can be accomplished through a systematic comparison of the relative costs and health effects of candidate programs—economic evaluation. Economic evaluation can be defined as the comparative analysis of alternative courses of action in terms of both their costs and their consequences.7 For health care programs, costs are the monetary inputs required to fund the program, and consequences are the health effects, both positive and negative, that occur as a result of the program. Two important concepts are fundamental to economic evaluation: opportunity cost and efficiency. Opportunity cost is based on the principles of scarcity and choice. Given scarcity (ie, not enough resources exist to meet all the desires of a society), societies must make choices, and, in the case of health care, these choices include which health care programs to implement and which to forego. The opportunity costs of health care programs are the benefits associated with those programs that are not chosen. In health care, efficiency is a measure of how much health benefit is produced for a given cost. In health economics, 2 types of efficiency are often considered: technical and allocative efficiency. Technical efficiency measures the extent to which health outcomes in a specific group of patients are maximized with a given set of resources. On the other hand, allocative efficiency attempts to maximize health outcomes across different patient populations by choosing between programs that use a variety of inputs. Knowing whether you are asking a question of technical or allocative efficiency aids in selection of the correct economic evaluation. Economic evaluations can be classified into 3 broad categories: cost-effectiveness studies, cost-utility studies, and cost-benefit studies. All 3 consider costs in a similar fashion, but each differs in how it measures health benefits. The 3 types of economic evaluation are outlined briefly below. Cost-effectiveness analysis: In cost-effectiveness analysis, which can be used to address technical efficiency, health outcomes are measured in naturally occurring units such as units of blood pressure reduction, life-years gained, or deaths avoided. The specific outcome chosen will depend on the purpose of the intervention, and comparisons can only be made among interventions that can be measured in terms of the same health outcomes for similar populations of patients. Cost-utility analysis: When the goal is to maximize health outcomes across a population, an example of allocative efficiency, comparisons might need to be made between programs that target different patient groups. For example, if resources were limited, it might be necessary to compare a program for monitoring international normalized ratio for patients with atrial fibrillation with a program for diabetes case management. The goal of the first program is a reduction in the overall number of strokes, while that of the second is a reduction in diabetes complications. While the health outcomes of interest vary across these 2 programs, they can each be translated into life expectancy and quality of life, and their costs can be expressed in monetary units, allowing the programs to be compared on a common scale. Cost-utility analysis enables comparison across different health outcomes by measuring health effects with a utility-based scale, the most commonly used being the quality-adjusted life-year (QALY). Quality-adjusted life-years incorporate the preferences that are placed on health outcomes by weighting the length of life by its quality. Utility scores range from 0, for a state equivalent to death, to 1, for a state equivalent to perfect health. Translating health outcomes into QALYs serves 2 important functions. First, it provides a common scale on which to measure disparate health outcomes. Second, it allows the evaluator to take into account the values that individuals and society place on health outcomes. Economic evaluations can be conducted alongside clinical trials or using decision analysis. Often, the 2 approaches are used together. When an analysis is done alongside a clinical trial, the costs and consequences incurred and measured during the trial are used as the data inputs for the economic study. When decision analysis is used, a representative model of the events of interest is constructed, and data from multiple sources, including extrapolation from clinical trials, are used to derive model inputs. Decision analysis is particularly useful for therapies for chronic conditions, in which the applicable time horizon extends beyond the duration of clinical trials, often to the lifetime of the patient. 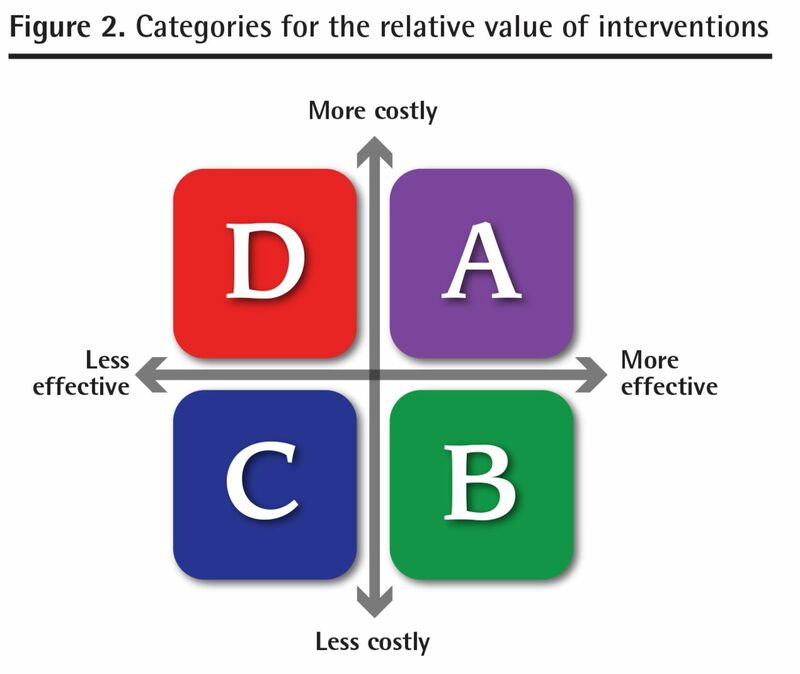 There are 4 broad categories that an intervention, relative to its comparator, can fall into: A) more costly and more effective; B) less costly and more effective; C) less costly and less effective; and D) more costly and less effective (Figure 2). Clearly, interventions that fall into category B should be implemented, as they will lead to both improvements in health and real cost savings. For example, Khazeni et al estimated that vaccinating 40% of the population against pandemic influenza (H1N1) in October or November of 2009 would not only save lives but would also save nearly $400 million (US).13 For the exact opposite reason, interventions in category D should not be implemented. When faced with interventions that fall into categories A and C, the ultimate question for decision makers is whether therapies associated with additional costs are an efficient use of health care resources. Most interventions studied fall into category A; they lead to gains in health but require additional resources. An intervention that falls into category C leads one to ask if sacrifices in health are worth the savings that would be garnered and potentially reinvested in other health-producing activities. Although the use of cost-effectiveness thresholds provides a relatively clean approach, it does not fully address the issue of opportunity cost. Critics have suggested that such an approach could lead to escalating expenditures without regard to where the additional health care resources would come from.21 Unless funds are diverted from other programs, the continual addition of interventions with positive ICERs, even if they fall below a given threshold, will inevitably lead to higher total health care expenditures. Because health care budgets are not limitless, the implementation of some interventions will incur an opportunity cost. Therefore, decision makers must look past the individual cost-utility ratio and assess the costs and benefits of each program relative to others. Returning to our case study, care of patients with diabetes was noted to be a priority for nearly all PCNs in Alberta. Consequently, these PCNs each committed a portion of their patient care budget to improving care for patients with diabetes, typically through establishment of multidisciplinary chronic disease management (CDM) programs.22 However, CDM programs for patients with diabetes, which can be categorized by the method used (Table 4),22,23 vary by relative effectiveness23 and by resource intensity (Figure 3).22 This is an ideal situation for the use of economic evaluation. 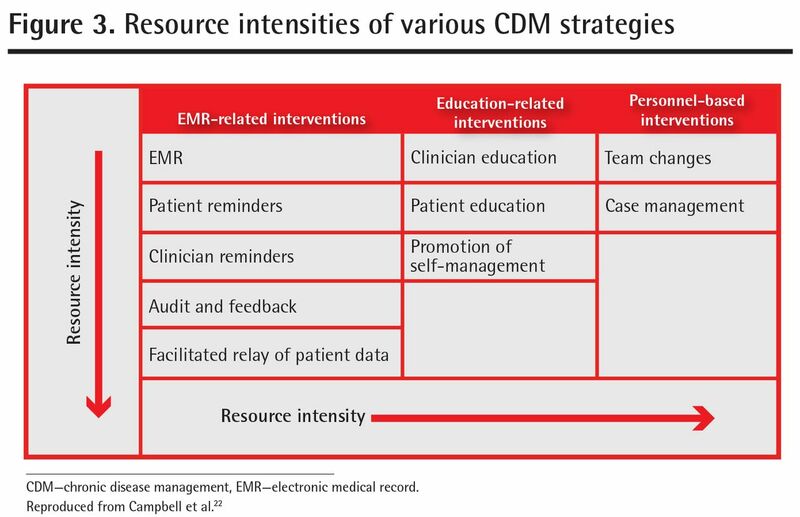 Future implementation of CDM programs, with the view to optimizing the mix of CDM programs for each PCN, could be facilitated through a systematic review of the clinical data and the use of economic evaluation. Among patient groups for whom several different CDM programs are possible, economic evaluation could be used to determine the expected costs and benefits for each of the candidate programs. Examples of clinical and cost inputs that might be relevant for such an economic evaluation are listed in Table 5. This list is not exhaustive and inputs will vary depending on the types of CDMs being compared, the type of economic evaluation (ie, cost-effectiveness vs cost-utility), and the data available. The results of an economic evaluation could then be used to aid in the selection of 1 or more CDM programs that fit the budget and style of a practice, while maximizing health benefits. The selection of a CDM program is but 1 example of how economic evaluation can be applied to the delivery of primary care. As the responsibility for allocating resources grows, the principles of economic analysis will become increasingly important. CDM—chronic disease management, EMR—electronic medical record. Taking into account the stresses on Canadian Medicare, including the opposing forces of a constrained health care budget and the steady advances in health care technology, the importance of incorporating economic information into health care decision making is evident. Moreover, in view of the changes that are occurring in primary care across the globe, economic evaluations are likely to become more relevant for policy makers and primary care practitioners alike. We have described the basic principles of economic evaluation and provided an introduction to its interpretation. Armed with a basic understanding of health economics, primary care practitioners can begin to incorporate economic data, including that from economic evaluations when they are available, into the care plans of their individual patients and, for those managing budgets, their practices on the whole. The Interdisciplinary Chronic Disease Collaboration is supported by an Alberta Innovates–Health Solutions (formerly Alberta Heritage Foundation for Medical Research) Interdisciplinary Team Grant. Primary care physicians have traditionally played an indirect role in the allocation of health care resources, while government policy makers and health care payors have maintained direct responsibility for deciding how health care funds are spent. Given the emergence of new primary care payment models that have accompanied health care reform, the balance of responsibility for resource allocation is beginning to shift toward primary care practices. It is therefore becoming important for primary care physicians to develop a systematic approach to health care priority setting, including assessing the costs and benefits of interventions. Economic evaluation provides a framework within which these costs and benefits can be assessed objectively. Les médecins en soins primaires ont traditionnellement exercé un rôle indirect dans l’attribution des ressources en santé, tandis que les décideurs gouvernementaux et les payeurs des soins de santé ont conservé la responsabilité directe de décider comment les fonds sont dépensés dans les soins de santé. Compte tenu de l’émergence des nouveaux modèles de rémunération dans les soins primaires qui ont accompagné la réforme de la santé, la balance de la responsabilité en matière d’attribution des ressources commence à pencher du côté des établissements de soins primaires. Il est donc important que les médecins en soins primaires élaborent une approche systématique de l’établissement des priorités en matière de soins de santé, y compris l’évaluation des coûts et avantages des interventions. L’évaluation économique offre un cadre selon lequel ces coûts et avantages peuvent être mesurés objectivement. Dr McBrien performed the background research and wrote the first and revised drafts of the manuscript. Dr Manns provided expert knowledge, content direction, and editorial support.
. Primary care reform—a national overview. CMA Leadership Series: Primary Care Reform. Ottawa, ON: Canadian Medical Association; 2004.
. Accountable care organizations—the fork in the road. N Engl J Med 2011;364(1):e1. Epub 2010 Dec 22.
. Becoming accountable—opportunities and obstacles for ACOs. N Engl J Med 2010;363(15):1389-91.
. Unified budgets for primary care groups. BMJ 1999;318(7186):772-6.
. Equity and excellence: liberating the NHS. London, UK: The Stationary Office Ltd; 2010.
. Primary Care Initiative. About PCNs. Edmonton, AB: Government of Alberta; 2010. Available from: www.albertapci.ca/ABOUTPCNS/Pages/default.aspx. Accessed 2011 Jan 15.
. Methods for the economic evaluation of health care programmes. 3rd ed. Oxford, UK: Oxford University Press; 2005.
. A cost-effectiveness analysis of screening urine dipsticks in well-child care. Pediatrics 2010;125(4):660-3.
. Cost-effectiveness of self-monitoring of blood glucose in patients with type 2 diabetes mellitus managed without insulin. CMAJ 2010;182(1):28-34. Epub 2009 Dec 21. Guidelines for the economic evaluation of health technologies: Canada. 3rd ed. Ottawa, ON: Canadian Agency for Drugs and Technologies in Health; 2006.
. Decision making in health and medicine: integrating evidence and values. Cambridge, UK: Cambridge University Press; 2001.
. Efficacy of self-monitoring of blood glucose in patients with type 2 diabetes mellitus managed without insulin: a systematic review and meta-analysis. Open Med 2010;4(2):e102-13.
. Effectiveness and cost-effectiveness of vaccination against pandemic influenza (H1N1) 2009. Ann Intern Med 2009;151(12):829-39.
. Cost-utility analyses of intensive blood glucose and tight blood pressure control in type 2 diabetes (UKPDS 72). Diabetologia 2005;48(5):868-77.
. Cost effectiveness of aspirin, clopidogrel, or both for secondary prevention of coronary heart disease. N Engl J Med 2002;346(23):1800-6.
. Cost-effectiveness of implantable cardioverter-defibrillators. N Engl J Med 2005;353(14):1471-80.
. Population based screening for chronic kidney disease: cost effectiveness study. BMJ 2010;341:c5869.
. How attractive does a new technology have to be to warrant adoption and utilization? Tentative guidelines for using clinical and economic evaluations. CMAJ 1992;146(4):473-81.
. Searching for cost effectiveness thresholds in the NHS. Health Policy 2009;91(3):239-45. Epub 2009 Jan 24.
. Cost effectiveness analysis in health care: contraindications. BMJ 2002;325(7369):891-4.
. Use of chronic disease management programs for diabetes. In Alberta’s primary care networks. Can Fam Physician 2013;59:e86-92. Available from: www.cfp.ca/content/59/2/e86.full.pdf+html. Accessed 2013 May 8.
. Effects of quality improvement strategies for type 2 diabetes on glycemic control: a meta-regression analysis. JAMA 2006;296(4):427-40.